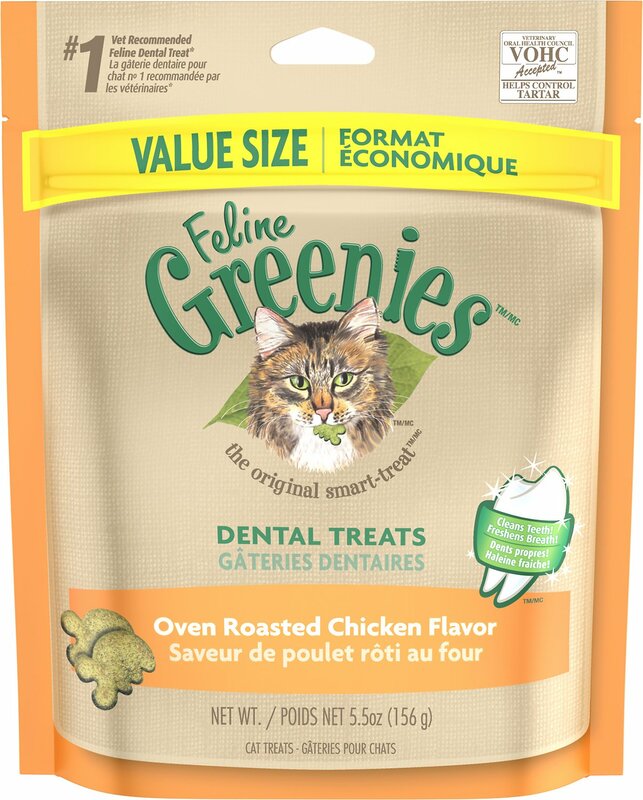 Reward your favorite feline with a great-tasting snack that delivers essential health benefits when you give her Greenies Feline Oven Roasted Chicken Flavor Dental Cat Treats. These delicious, crunchy morsels feature the paw-sitively irresistible taste of real chicken along with a unique shape that helps scrape away plaque and tartar as she chews for cleaner teeth and fresher breath. 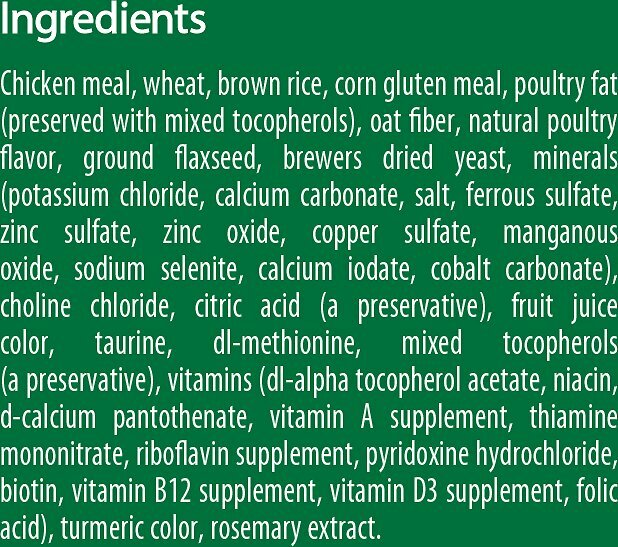 Chicken meal is the first ingredient for real chicken protein that enhances the taste and promotes healthy metabolism. Delicious, crunchy morsels feature a unique shape that helps scrape away plaque and tartar as she chews. Fortified with a variety of essential vitamins and minerals that support her overall health and well-being. 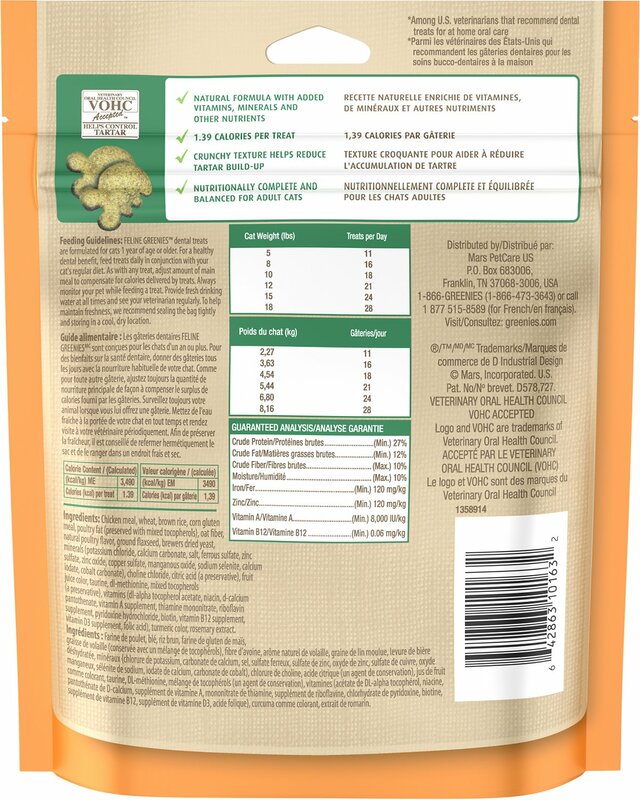 Chicken Meal, Wheat, Brown Rice, Corn Gluten Meal, Poultry Fat (Preserved With Mixed Tocopherols), Oat Fiber, Natural Poultry Flavor, Ground Flaxseed, Brewers Dried Yeast, Minerals (Potassium Chloride, Calcium Carbonate, Salt, Ferrous Sulfate, Zinc Sulfate, Zinc Oxide, Copper Sulfate, Manganous Oxide, Sodium Selenite, Calcium Iodate, Cobalt Carbonate), Choline Chloride, Citric Acid (A Preservative), Fruit Juice Color, Taurine, Dl-Methionine, Mixed Tocopherols (A Preservative), Vitamins (Dl-Alpha Tocopherol Acetate, Niacin, D-Calcium Pantothenate, Vitamin A Supplement, Thiamine Mononitrate, Riboflavin Supplement, Pyridoxine Hydrochloride, Biotin, Vitamin B12 Supplement, Vitamin D3 Supplement, Folic Acid), Turmeric Color, Rosemary Extract. Feed as a snack or treat in conjunction with your cat’s regular diet. 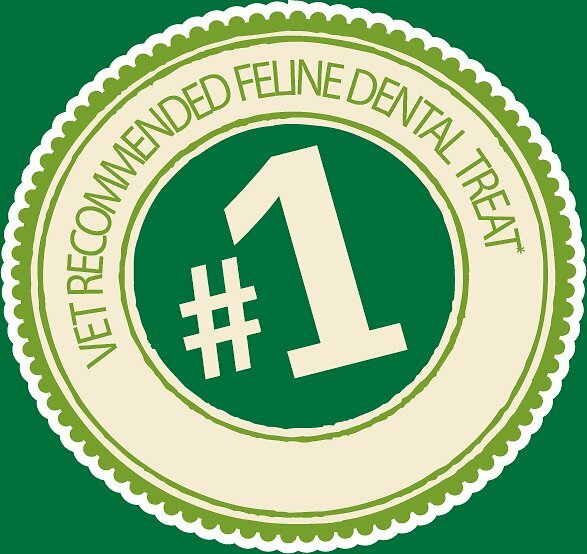 For the best dental benefit, feed FELINE GREENIES™ Dental Treats daily. As with any treat, always adjust amount of main meal to compensate for calories delivered by treats. 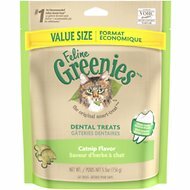 FELINE GREENIES™ Dental Treats are formulated for cats 1 year old or older. Provide fresh drinking water at all times. See your veterinarian regularly. To help maintain freshness, we recommend sealing the bag tightly and storing it in a cool, dry location. ATTENTION: As with any edible product, monitor your cat to ensure the treat is adequately chewed. Gulping any item can be harmful or even fatal to a cat. I have 2 cats and one of them rarely ever eats treats so I was happy to see that they both like them or in fact love them, maybe too much as they love them over their own food and begin to want these instead of their food. One thing that I've noticed is that sometimes one of my cats just swallows them whole and rarely chews I'm not sure if they were made a bit bigger if it would force cats who don't chew, to actually chew it. I haven't noticed a huge difference since I started giving these to my cats but I will continue to give these to them and hopefully it'll help their teeth as well as being a great treat. Both of my cats beg to eat these. Matilda knows that they are stored in the pantry and has figured out how to open the door to the pantry to let me know that she wants the Greenies. They like the roasted chicken flavor the best. I tried salmon and they don't beg for these. They will eat them if there is nothing else. Brother and sister kitties and very different teeth and gums. The vet recommended these, but I bought them at Chewy because they were more reasonably priced. Our female Annie has teeth and gum issues, so this will be a blessing for her to improve the removal of tartar. Theo LOVES these. I call them “num nums” and he has to preform his tricks for them. However, I really don’t think they clean his teeth well at all. Still going to keep on getting them though! They are the only treats he likes! My cat loved these treats immediately and that was a great surprise. He is a fussy guy and set in his ways. Also needed additional help with cleaning his teeth. So these are great for him and fun to give him. All the kitties enjoy this treat! I have to give this full stars because all 3 of my cats like it, and hasn't happened before with treats. Sure, 2 out of 3 isn't bad, but I want something they all like. That way, the odd man out doesn't get a treat while the other two gobble theirs down. Plus, the kitties have been to the vet recently for their annual checkup, and the vet was very happy with their teeth! We have a mid-afternoon routine. I call out "Who wants Greenies?" and my three cats come racing to the kitchen, pushing against each other to be the closest. I don't even need to shake the bag. They really love their Greenies! One of the best things you can do for your cat! They really do help fight plaque and tarter without any of those nasty fillers cats don't need and my cats LOVE em! They won't go a morning without their Greenies!